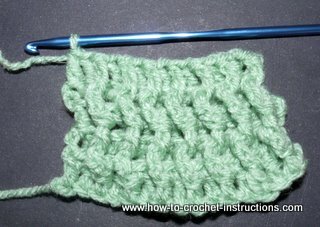 There are two basic ways of working crochet ribbing. One uses single crochet (UK double crochet) and produces a nice stretchy welt and is worked sideways. The second rib stitch uses a long stitch, usually trebles (UK double trebles). This produces a bulkier and less stretchy welt, but is quicker to work and is nice to use on an aran style garment as crochet aran stitches are produced in much the same way. First, make a length of chain approximatley the width you want your welt to be. One the next row and all subsequent rows, work single crochet into the back loop only. Keep working until your piece is the length you want it when stretched a little. You can either sew the welt in place, or, what I prefer to do is to crochet straight onto the lenth of it as in the photo above. RTF = round treble forward -make a treble (UK double treble) but insert the hook around the stem of the stitch on the side facing you instead of into the stitch. 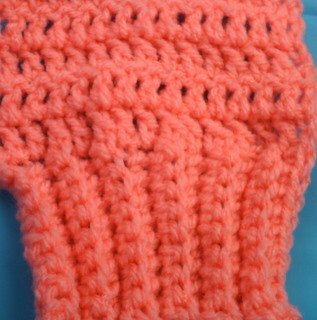 Unlike the last version of crochet rib stitch, this edging is worked as a continuation of the rest of your work. keep alternating front and back all along thw row. This will have the effect of pulling the posts of the stitches forwards and backwards, raising them up in ridges. On the next row, if you worked an RTF on a stitch on the previous row, work a RTB this time, and vice versa.